I didn't make this. But I will must should will try to might! Photo from Land of Nod. Saw it last year when it was too late to sew it. Kicked myself. Vowed I would make it for 2009. Remembered it today and thought I'd share it in case anyone else wants to take it on. We have 3 months if we start now. Yesterday the weather turned and finally felt fall-like. And I realize I love autumn. And I'm not mourning the end of summer anymore. And I got a bit excited about the prospect of Halloween and cider and soups and homemade bread and generally better food than the pizza delivery usual stuff that we have been eating all summer. And Christmas, of course. For all the real reasons as well as the decorative ones. I've started work on my "before December 25" list. But it also keeps growing. I'm hoping that by starting 3 months early some of the projects will get finished. That garland is cute - should I add it to my list or not? Not just me then with the good intentions and dreams etc. The trouble is I really believe they shortened the week and did not alert the population. That look sfun to do, hope you manage to. Do share if you do. Aww that is super cute. I need to get some wool felt, I saw some other ornaments on a blog that would go with that so well on my boring Christmas tree. That's what I get for giving away home made gifts, there's no time left to make your own! Oh it's so good to know all you other folks have lists, too. Mine is full of foolish, self-imposed deadlines on self-imposed projects. Including the middle child's birthday just after Halloween, which necessitates both costumes for Halloween and handmade gifts for the birthday, and a party. I'll be burnt out by Thanksgiving! No turkey garlands for me. 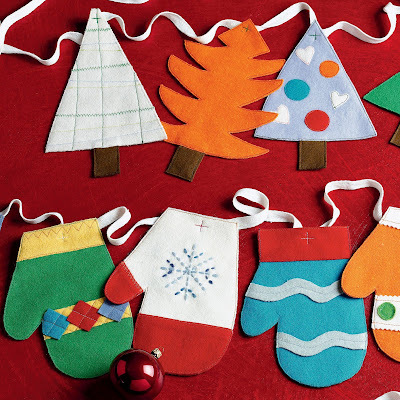 These are adorable, and we could definitely use some cute Christmas decorations at our house. What is this chicken business?????? You're killing me!